I’m not a swimmer, at least, I wasn’t. That said, I didn’t use to be a biker, either. What changed both of these things? Music. I’m a music lover, and I haven’t gone a day my whole life without playing, singing, or listening to some music. Also, in recent years I’ve become a big fan of podcasts. I fall asleep to a podcast almost every night, and I value them highly. Biking plus music? Easy. I inherited a bike from my older brother, and I have a built-in MP3 player in my phone, so all it took was one try listening to music/podcasts while biking, and I was hooked. It seemed like I could go forever! Then my knees started to hurt. Blast. My wife recommended swimming. Oh, dread. I couldn’t swim very well, and when you can’t swim very well, you won’t want to swim for very long … especially without music. Enter AudioFlood. 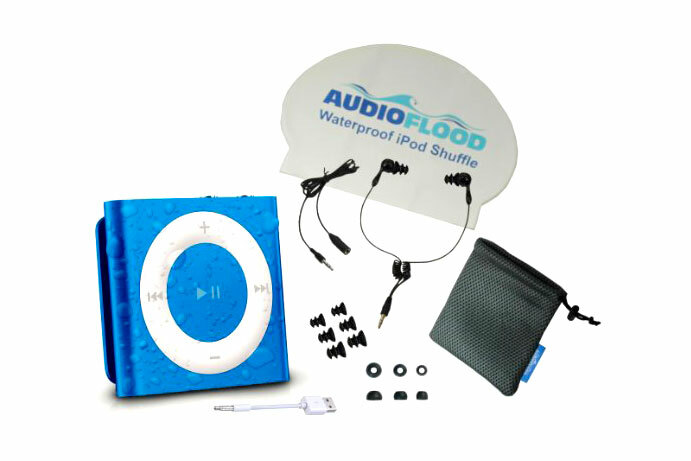 I got my hands on a Waterproof Apple iPod Shuffle by AudioFlood, and … what’s that? You don’t believe me? Yes, a real iPod. Yes, made by Apple. Yes, it’s totally waterproof. And yes, of course, the headphones are waterproof, too. Long story shortened: I feel like I can swim forever if I have some awesome tunes in my ears or an entertaining podcast. Before AudioFlood, I think the most I’d ever swum was like 10-15 minutes. My very first try with the iPod? 50 minutes! I’m serious, this thing changed the way I look at swimming and even exercise in general. Do yourself a favor, and take your swim for a music … or the other way around. Music is great in the pool! I struggled with the “in ear” fit of many waterproof mp3s. There are bone conduction ones by Finis, but I found the sound changed a lot under and over the water. Also the volume was a little low. I discovered one by FX-Sport which were wire-free headphones with an integrated mp3. Their idea was to put them into a “silicone flexible case” which is worn under a swim cap. The idea is that the headphones don’t have to be fully waterproof and therefore give better sound quality, and they can use the air in the case to generate good bass. Ok…gave it a go and it worked! Best sound quality and nice and secure. The headphones also have a “customizable personal trainer” feature, where you can upload workouts to the headphones. I tried this only recently as I bought mainly for the music. It also works well. Now I swim with my music, time notifications for my workout and any messages I choose to add in between. The other aspect is that once out of the case, they can be used for when I make a trip to the gym and the sound quality is far better than if I had bought a standard waterproof mp3.